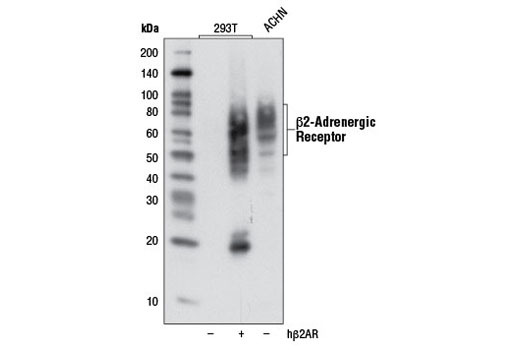 Western blot analysis of ACHN cells or 293T cells, either mock transfected (-) or transfected (+) with a cDNA expression construct encoding human β2-adrenergic receptor (hβ2AR), using β2-Adrenergic Receptor (D6H2) Rabbit mAb. β2-Adrenergic Receptor (D6H2) Rabbit mAb recognizes endogenous levels of total β2-adrenergic receptor protein. Monoclonal antibody is produced by immunizing animals with a synthetic peptide corresponding to residues near the carboxy terminus of human β2-adrenergic receptor protein. There are four major Adrenergic Receptor (AR) subtypes (α1, α2, β1, β2). Each of the subtypes has been classified by their unique responses to agonists and antagonists. Adrenergic receptors belong to the family of guanine nucleotide-binding, regulatory protein-coupled receptors (GPCR) which transverse the plasma membrane seven times. The transmembrane regions are hydrophobic and are interconnected by hydrophilic loops (1). β2-Adrenergic Receptor (β2AR) is the most studied receptor of the catecholamine system. β2AR stimulation occurs through the catecholamines epinephrine (adrenaline) and norepinephrine (noradrenaline) acting as neuromodulators in the central nervous system and as hormones in the vascular system. β2AR activation results in coupling to heterotrimeric G proteins and activation of the second messengers cAMP and phosphatidylinositol, ultimately leading to changes in cellular physiology. GPCR kinases (GRKs) terminate β2AR signaling through phosphorylation of the GPCR and by recruiting β-arrestin. β-arrestin binding uncouples the receptor from the G protein, thereby terminating G protein–mediated signaling (desensitization), and initiating clathrin-mediated endocytosis (internalization) of β2AR (2). β-adrenergic blocking agents (beta blockers) are drugs that block catecholamines from binding to βAR and are prescribed for cardiac arrhythmias, cardioprotection after myocardial infarction (heart attack), and hypertension (3). Dohlman, H.G. et al. (1987) Biochemistry 26, 2657-64. Nobles, K.N. et al. (2011) Sci Signal 4, ra51. Baker, J.G. et al. (2011) Trends Pharmacol Sci 32, 227-34.